History of the Chair – A Story to Sit and Enjoy! You’re probably reading these words while sitting in a reasonably comfortable chair. It’s either got four legs or is mounted on casters, allowing you to roll around and reach various parts of your desk without getting up. Most likely it’s got features like lumbar support, and is ergonomically designed to facilitate better posture, but how much do you really know about chairs in general? Where do they come from? How long have they been around? What were the significant developments in the evolution of the chair, and who were the major players? We’ll answer all those questions below, and the story is a lot more interesting and intriguing than you might think! 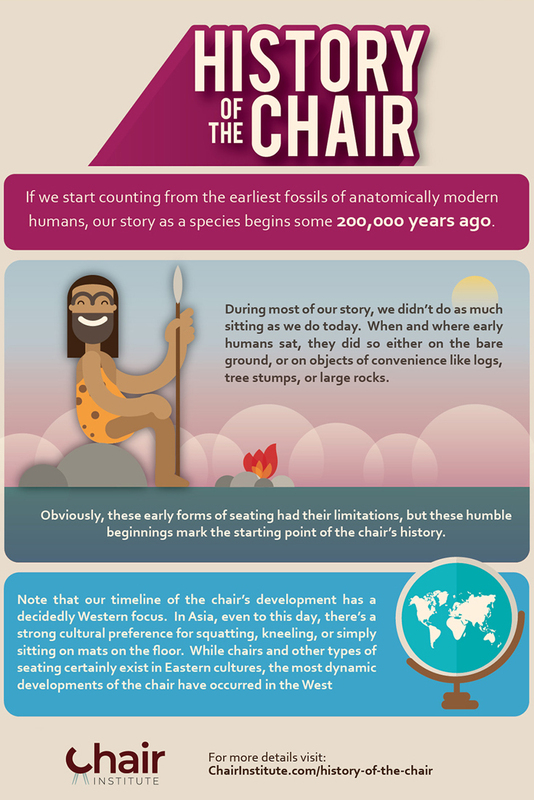 The simple truth is that for most of human history, we didn’t have chairs. In earliest times, when people sat at all, they used objects of convenience. Fallen logs, rocks, stumps or they just sat on the ground. Often, people didn’t even use that. In Asia, even to this day, many people prefer simply squatting or sitting on their heels. The very first chairs that came into existence were incredibly rare, and their use was reserved for people of extreme importance: kings, high priests, and the like. Unless you were one of those, you were virtually guaranteed to go your entire life, never having sat on one. These date back as far as A﻿ncient E﻿gypt. Pharaohs are almost always depicted in sitting on thr​ones that closely resemble the modern four-legged, high-backed chair so commonly seen in today’s world. For a brief period, in Ancient Greece, a chair called the curule seat made an appearance, only to vanish a few centuries later. It was essentially a folding chair, believed to have been used by artisans and philosophers. Concurrent with this chair’s development was the invention of the klismos, which features curved legs and a curved backrest. It is widely regarded as being the most beautiful chair ever invented. While its use wasn’t limited to nobility, it wasn’t exactly common either, and mysteriously, after only a few centuries of use, it vanished entirely, just like the curule, and didn’t reemerge until 18th Century European craftsmen brought them back, using ancient murals and statues to accurately reproduce them. The Ancient Romans, like the Egyptians, placed their priests and emperors on thrones, and lounging divans became common in Aristocratic homes. The famous Roman Senate featured bench-style seating, as did the Colosseum, and this technology filtered into general society, with bench-style seating competing with stool seating among the legions of the plebs. This trend continued with the birth of Christianity, with bench-style seating dominating churches, and a mix of bench and stool-style seating permeating the lives and culture of the rank and file in the Western world, while chairs (thrones) were still used almost exclusively by the nobility. That began changing during the Renaissance period. The exact reasons for this are the subject of much debate. But one of the biggest events immediately preceding the Renaissance was the plague, which redefined European society. It’s easy enough to imagine such a disruptive event could have led to the mainstreaming of the chair. The first chair to be widely reproduced came from Renaissance Italy, when a cabinet maker named Guise﻿ppe Gaetano Descalzi, who lived in the city of Chiavari, was commissioned by the Marquis Stefano Rivarola to redesign an opulent Empire-Style chair he acquired from Paris. Descalzi’s design was crafted from lighter, less expensive materials, with less detail work carved into it. Bear in mind that although these chairs were produced at various workshops throughout Italy, we’re talking about pre-industrial society, so they were not “mass produced” in the same way we understand the term today. Nonetheless, they were produced in sufficient quantity that they began making their way into mainstream society. They became known as “Chiavari chairs” after the city they were first built in. We know them better today as banquet chairs, and in the West, these were probably the first chairs that became commonly seen outside the homes of Aristocrats. While this is interesting, the chair with perhaps the most intriguing history is the one you’re likely sitting on right now: the common office chair, which may be the most ubiquitous piece of furniture on the planet. It was invented by none other than Charles Darwin of the Theory of Evolution fame. He took a desk chair, which was modeled after a Captain’s chair (straight-backed with armrests), and put it on r﻿﻿olling caste﻿﻿rs so he could more easily reach his various experiments and notes without having to get up. The design was popularized by none other than Otto von Bismarck, who distributed through Parliament in the hopes of making his government employees more efficient and productive. Most of the major innovations in office chairs were made during this period, which brings up an interesting point about chairs. When you compare chairs to virtually every other technology in use today, a striking difference emerges. Imagine, if you will, trying to use an iPhone from three or even five years ago. If you could get it to work at all, your experience would be trying, to say the least. On the other hand, if you buy an office chair today, it wouldn’t be profoundly different from ones used by members of Otto Von Bismarck’s parliament. If you bought an antique office chair from Bismarck’s day, it would not look and feel all that different from the one you’re sitting in now. Just like today’s Windsor chairs are virtually indistinguishable from the ones used by Benjamin Franklin and George Washington. All this to say that chair technology changes very slowly when it changes at all. Sure, there have been incremental advances (the ergonomic features in office chairs, for example, were an outgrowth of the seventies, to cite one case), but the general trend remains absolutely true. Here, we have to say a few things about the way our choices in seating influences society as a whole. So far, you’ve probably noticed that aside from ancient times, the story of the chair has had a decidedly Western focus. This is no accident because modern chairs are uniquely Western in their influence and design. But of course, people in other parts of the world have invented their own varieties of seating as well. Around the world, you can identify more than a hundred distinct seating postures which have informed the development of different styles of chairs, where chairs are used. In China, chairs are commonly built with the seat back angled 45-degrees. Contrast that with the West, which features chairs that either have a straight back, or only a very mild reclining angle. Cultures that have developed a preference for squatting, sitting on mats or sitting on their heels are much more likely to develop storage solutions in their homes that are lower to the ground, and much less likely to sleep in beds, preferring sleeping mats. In a similar vein, non-chair sitters are much more likely to prefer wearing shoes like sandals that can be removed easily and tend to develop cultural norms involving the removal of shoes upon entering a home. Culturally, societies that sit on chairs develop an array of highly specialized furniture. If you’re going to sit on a chair, then you’re going to need tables, desks, and workbenches designed to the height of the chair you’re using, and this is, in fact, what happened in the West. With the dawning of the Industrial Revolution and the rise of mass production, it suddenly became possible to produce these types of furnishings in bulk, which dovetailed nicely with the rise of the middle class, creating ever more demand for these kinds of goods, which is what ultimately put chairs in just about every home in Europe, and later, America. While the Industrial Revolution made mass production possible, given the nature of chairs themselves, and how slowly their designs change over time, something else was needed to explain the explosion of different kinds of specialty chairs we see today. That “something else” is, of course, technology. Our better understanding of the musculoskeletal system led to the creation of chairs with better ergonomic support features. This same understanding resulted in the creation of the first massage chairs. The rise of the PC and platform game systems led to the creation of dedicated gaming chairs. As medical technology continues to advance, dental chairs have changed dramatically, but their most distinctive changes amount to technological grafting as new devices are added to them and the dental engine that invariably accompanies them. Our high-tech world has been a boon then, to the continuing evolution of the chair, but at the same time, it has led to a few serious unwanted side effects. As more and more of our work is accomplished while sitting down, and given the ubiquity of comfortable seating options in the home (recliners and living room lounging chairs became increasingly popular in post-war America), we’re spending an increasing number of hours a day sitting down. Think about it: Many people have a desk job, so at least 7-8 hours sitting. An hour (or more) sitting while commuting, more sitting while eating, and yet more sitting while unwinding for the evening at the end of a day. Combine that with 6-8 hours a night sleeping, and you begin to see the problem. Most Americans spend 17 hours (or more!) either sitting or lying down. It’s not healthy, and in fact, some in the medical community are now saying that sitting is the new smoking. This change in mindset has led to a new burst of seating options, including “standing chairs,” chairs built around exercise balls, footstools optimized to foster better posture, e﻿﻿rgonomic stools that look like they were built on an alien planet, and more. In recent years, with the rise of the Internet of Things (IoT), we’ve even seen the invention of smart desks that periodically rise to a height that would make them useful while standing, then lowering again later to help get desk workers off their butts and on their feet! There are even standing desks that have been merged with treadmills to allow people with desk jobs to get some exercise while they work. The facts outlined in the previous section might lead you to the conclusion that the chair’s days are numbered, and that we’ve seen the high-water mark of its use. That’s possible, but it’s probably too soon to sound the chair’s death knell. At this point, the market for standing desks and the innovative seating solutions surrounding them can best be described as a fad. It may be the case that the fad will catch on and gain some longevity, but even if it does, the chair in all its forms is so steeped in our society and culture that it seems unlikely to be displaced by a few warnings from the medical community about the health risks associated with too much sitting. Compare, for example, fast food in America. The medical community has been warning for decades about the dangers of consuming too much fast food, but the reality is that it’s more popular than ever. All that to say that the future of the chair isn’t in doubt. Although we may not be able to guess what form the chairs of the future might take, we can say with near-absolute certainty that it’s not going anywhere. Who knew that the chair had such a strange and winding history? It has gone from its earliest uses as a mark of distinction, reserved for Kings and Priests to being a mainstay of modern life and something essential for the proper functioning of modern society. While we may not know what the future holds for this humble utensil, one thing we can say for sure is that whatever form it takes, the chair is going to be an important part of it. Very helpful. This was amazing for school research. Nicely detailed time line. So wonderful to know it was helpful for your research Faith! All the best with your school project. Very interesting. Cool and surprising fact about Thomas Jefferson. Had no idea. Cool infographic too! Thank you for your kind words Jay! Jefferson’s fact is indeed a surprising one.